Dr. Terry Riley, in protective lenses, treating a patient with Class IV laser.Over the last few years the use of lasers in the United States has been widely promoted for many types of medical and non-medical purposes from eye correction surgery, to cosmetic applications, hair removal and hair restoration. Recently, the Class IV Laser was given FDA clearance for use in the United States for its effectiveness in dealing with pain related injuries, chronic pain, wound healing and rehabilitation. This Italian made laser is a pain-free, non-invasive, non-surgical, and virtually side-effect free treatment, usually taking 8-10 minutes with the only sensation typically being a slight warmness on the skin. Therapeutic lasers have been used in Europe by nurses and doctors since the 1970’s. 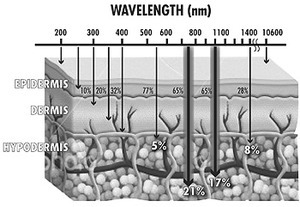 Laser Therapy, or “photobiomodulation”, uses specific wavelengths of light (red and near infrared) to create therapeutic effects. These effects include improved healing time, pain reduction, increased circulation and decreased swelling. During each painless treatment, laser energy increases circulation by drawing water, oxygen and nutrients to the damaged area. This creates an optimal healing environment that in turn reduces inflammation, swelling, muscle spasms, stiffness and pain. As the injured area returns to normal, function is restored and pain is relieved. An extremely high success rate with patients is causing a huge stir in the medical and therapy professions. There are thousands of published studies demonstrating the clinical effectiveness of Class IV Laser therapy for those who suffer with: Osteoarthritis; Rheumatoid Arthritis; shoulder, back, neck and knee pain; achy/stiff joints; muscle strain; fibromyalgia; carpal tunnel syndrome; Plantar Fasciitis; muscle and ligament tears; ligament sprains; lateral epicondylitis (tennis elbow); sports injuries; trigger points and muscle spasms; repetitive stress fractures and injuries; Herpes Zoster(shingles); burns; non-healing wounds; trigeminal neuralgia; poor circulation; post traumatic injury; Achilles tendinitis; sciatica (leg pain); rotator cuff tear; nerve pain and more. It is important for people not to confuse Class IV Laser therapy with other types of lasers or electric pulse type stimulators which offer very minimal, if any, healing power. Much of the “feel good” results from these other types of modalities are usually temporary at best. There is no comparison to the kind of results the patients receive from the Class IV Laser because it is the most advanced. Only “Certified Laser Technicians” are allowed to operate a Class IV Laser in a doctor’s office. The Pacifica Laser Pain Center in Dana Point www.PacificaLaser.com or 949-388-4581.